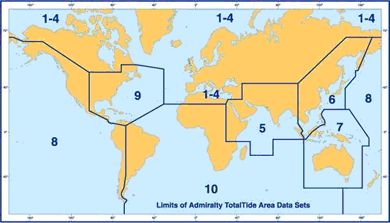 ADMIRALTY TOTALTIDE provides bridge crews with fast, accurate tidal height and tidal stream predictions for more than 7,000 ports and 3,000 tidal streams worldwide. TOTALTIDE provides bridge crews with fast, accurate tidal height and tidal stream predictions for more than 7,000 ports and 3,000 tidal streams worldwide. This global coverage, which is split across 10 areas, enables users to take advantage of the tides whilst reducing risk to crew, cargo and ships. Enabling quicker and more informed decisions, ATT allows users to instantly calculate tidal heights for multiple ports during a period of seven consecutive days. Crews can also use the software to calculate and view safe clearances based on a ship's draft, masthead and under-keel clearance allowance. This information, which is quality assured by maritime experts at the UKHO, is presented in user-friendly graphical forms to help bridge crews understand predictions at times of peak-workload and pressure. TOTALTIDE is integrated with the UKHO database of over one million tidal constants, which is also updated weekly in line with ADMIRALTY Tide Tables.